Is this possibly the spider that bit Spiderman? I’m thinking…maybe? Well, on the other hand, maybe this isn’t the one who created Spidey. Wasn’t that one was supposedly, what, radioactive? 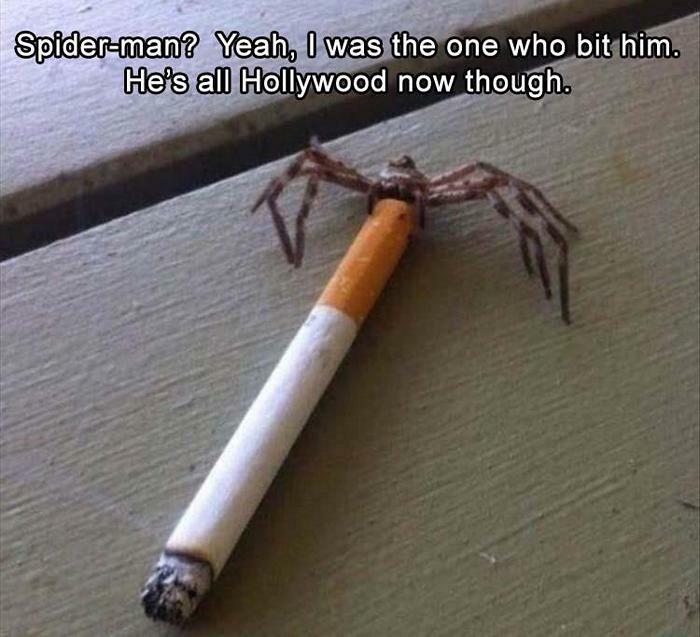 This spider just looks like he developed a really bad habit. then again, he is really big. Could probably take Peter Parker down. Or at least make him scream like a little child. Then maybe you can clear this all up for the rest of us? I grew up watching the cartoon and stuff, and have enjoyed the new kid in the Avenger movies (that guy before him, what was his name? Cody something? Or Jody? Looked like a Jody, anyway. Tobey, that’s right. Yeah, not so much.